BRYAN EATON/Staff photo. 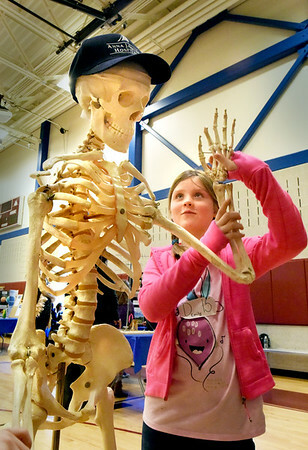 Emily Chandler, 8, gets acquainted with Stanley at the STEM (Science, Technology, Engineering and Math) Expo at the Bresnahan School in Newburyport on Friday morning. Lynda Kuhne, director of physical therapy at the Anna Jaques Hospital, was one of the interactive presentors at the school, in this display letting children know that Stanley had a cracked skull, relating how helmets are important when riding bicycles.